EUR/NZD is trading in an extremely narrow range with session highs at 1.6437 and lows at 1.6394. The pair is pivotal at 'Triangle Base' support at 1.6415, break below will accentuate weakness. The single currency fell sharply after release of downbeat French and German PMIs. 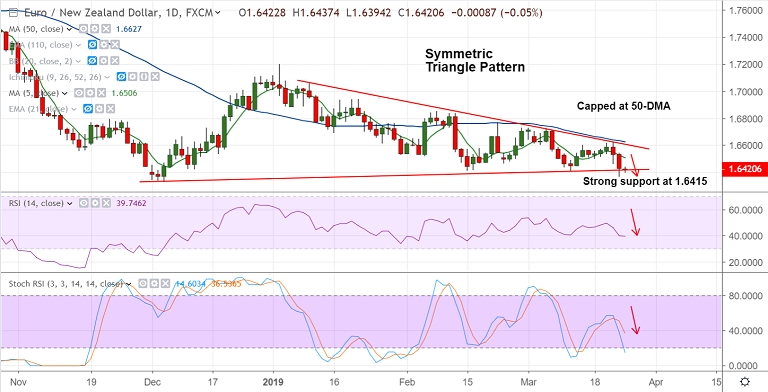 The pair is trading in a ' Symmetric Triangle' pattern and upside remains capped at 50-DMA. Technical indicators are biased lower. Momentum with the bears. Breach at 1.6415 can see weakness till 200W SMA at 1.6360. Focus on German IFO Business Climate index for further impetus. Break below 200W SMA likely to confirm further weakness.